Some time back – before we had children – Jake and I read a book on the subject of initimacy. It detailed small steps a husband and wife can take to keep the romance alive and kicking, even through the rough times. If you can believe it, there was a chapter on hygiene. For men, this chapter mostly reminded them that if they wanted to get close to their woman, they’d have to shower and pluck their nosehair. For women, the chapter mostly reminded them that if they wanted their man to stay even remotely engaged in the marriage, they would need to a) maintain and cultivate a physical relationship, and b) stop wearing sweats. Now, when I read this, I knew exactly which piece of clothing the book was asking me to give up. : the Yale sweatshirt. This item of clothing has been with me since I snagged it from an old boyfriend in high school. It bears traces of paint and woodstain from all our many projects over the years, so it’s sentimental. And, quite simply, I adore it. Unfortunately for Jake, it is my Team Building Exercise ’99 shirt. If you understand that reference, I have said quite enough. The inherent problem in the Yale sweatshirt situation – the reason I can’t give it up – is that it’s large enough to cover up any unsightly bulges I may be harboring, namely a baby bump. During the last three months of my pregnancy with Seabass, the Yale sweatshirt became a constant companion, sending Jake more into the role of a very kindred roommate than that of a husband. 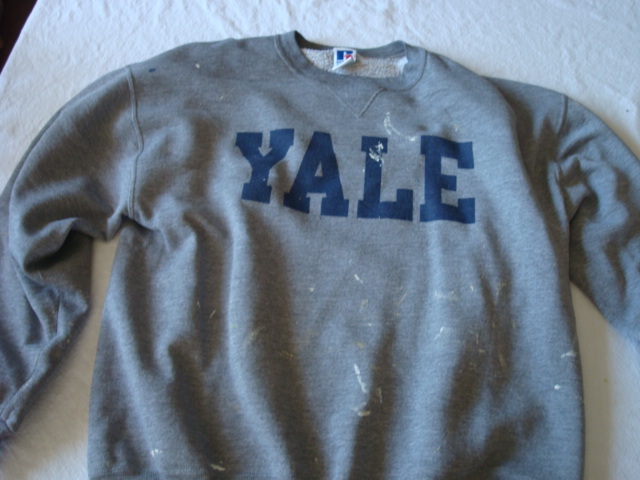 Anyway, the Yale sweatshirt came out again a few nights ago, and I could almost smell Jake’s disappointment. Is this really happening again? I could hear him ask himself. And my answer? Awww, yeah. Personally I love the YALE sweatshirt. I’d know is as your anywhere. As long as it has an slutty sister – nonequivalent – than you’re all good! Would you mind sharing the book title that you mention in your post? Also, the Yale sweatshirt looks cozy! Take advantage and rock it. Sure! It was called Sheet Music by Kevin Lehman.